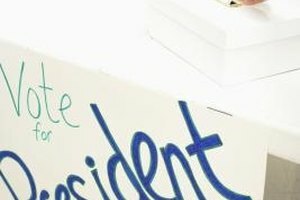 Student council nominees often use slogans to gain votes. 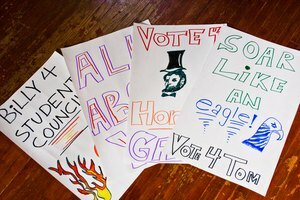 Students who are running for student council need a catchy, funny or interesting slogan to help make themselves memorable to their classmates. 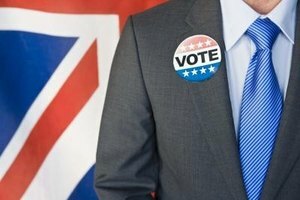 While the slogan is only part of the voting process, the slogan will help others remember the name of their favorite candidate, especially in smaller schools. Funny slogans include puns or make students laugh, depending on the type of humor. For a student campaign, the slogan might include odd images, such as a fish with the candidate's name on it saying "Catch of the day!" 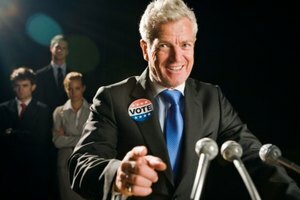 Funny slogans start with an idea about the candidate and then poke fun at the candidate to insight humor in peers. Among the types of slogans often seen in student council campaigns are rhymes. A nominee can start with her name, such as Vicky or Emily, and then make a rhyme to go with it. For example "Don't be icky -- vote for Vicky" or "Vote for me -- I'm Emily." These catch attention by rhyming, and, depending on the type of rhyme, it might stick easily in the minds of classmates. Promise slogans include an aspect of what the student hopes to accomplish while in the student council, for example, "Vote for Katie -- she'll fix the bathrooms." This type of slogan takes a noted problem, like bathrooms that don't work, and works it into the campaign slogan as a promise to the students. Students should avoid promise slogans they will be unable to keep, such as changing the number of days each week students attend school. Slogans that provoke students against the opponents by making them think is another type of student council slogan. This type of slogan should avoid the mean and use statements to get students to think about the future. For example, "Jamie Johnson: Tell Her the Changes You Want" or "John Is the Student for Change" get students involved in the process. MayankJ. "Ideas for Student Council Slogans." Synonym, https://classroom.synonym.com/ideas-student-council-slogans-8158572.html. Accessed 23 April 2019.